‘Tis said that when an aviator simultaneously runs out of airspeed, altitude and bright ideas that something will go bump in the night, and that’s exactly what happened at four minutes past the hour of one o’clock on the Monday morning of January 21, 1985. Galaxy Airlines, a charter carrier, transported an unspecified number of souls from Minneapolis westward early on a Super Bowl weekend. Some flew to San Francisco and then motored by bus to nearby Stanford, the site of the 1985 Super Bowl. The remainder stayed aboard to Reno for bus travel to a casino in Stateline. 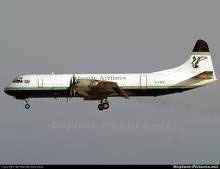 The airplane, a Lockheed Electra propjet, reportedly made several other flights during that weekend carrying passengers unrelated to the Minneapolis junket. Following the game the Stanford contingent traveled by bus to Reno, and a number of them elected to stay at the Hilton, (then MGM) [now Grand Sierra Resort], for a time. They were the lucky ones. The others rejoined the Stateline group at the airport for passage home. There were 65 passengers and a crew of six aboard the Electra when it was cleared for southbound takeoff on runway one-six at 1:02 a.m. It is known that at 1:03 the co-pilot reported a severe vibration in the aircraft to RNO tower, requesting expedited clearance to land with emergency equipment standing by. Per the flight recorder on the plane he pulled power to reduce the vibration, causing the plane to stall below the airspeed needed to maintain control. And it is speculative that he then looked for a “black hole” – an absence of ground lights – to aim the doomed aircraft toward for an “unplanned landing” – the FAA euphemism for a crash – without effecting danger to those on the ground. That hole, if in fact he was in control, was in the area of Del Monte Shopping Center on South Virginia Street. The plane, now heading west, initially hit the ground near the old V&T railroad right-of-way, then caromed into a ditch and broke in half, coming to rest in a motor home sales lot adjoining the then-Normark Furniture Store with some debris spilling across South Virginia. The plane and seven motor homes became instantly involved in a conflagration fed by 12,000 pounds of fuel in the wings. The emergency response was immediate and massive; records show 16 units from the Airport Authority (who were alerted by the tower with the initial MayDay), Reno Fire Department, and Truckee Meadows Fire Protection District arriving at the scene in short order. Two sheriff’s deputies investigating a burglary at a store a long block from the crash were virtual eyewitnesses to it, and relayed that this was not a light-plane incident, as one radio transmission had indicated, but a large-scale disaster. They were soon joined by a hundred more deputies, Reno Police and highway patrol officers. Crowd control became paramount. South Virginia Street was closed and traffic rerouted to then-rural, two-lane Longley Lane, as it would be for another day to follow. The three fire departments protected the furniture store, extinguished the aircraft fire and a number of spot fires in the fields surrounding the site. Some Sparks Fire Department apparatus were relocated to Reno stations to back up the committed Reno engines; off-duty Reno firefighters manned older reserve equipment and Nevada Air National Guard units covered the Airport Authority’s duties at the airport. Most the agencies were released by 4:28 a.m. Truckee Meadows FPD (which would years later to merge with Reno Fire) would remain on the scene for days to follow and later took primary responsibility for the victim recovery. Trustees from the county jail were employed to place opaque masking along South Virginia Street to prevent the slow-down-and-gawk syndrome that impeded traffic when the street was reopened on Tuesday. Three passengers initially survived the crash – one was transported by helicopter to St. Mary’s Hospital, which had established the medical administrative command post. Of those three only one, a then-17-year-old boy [George Lamson] with relatively minor lacerations, would survive. The victims were removed to a temporary facility at the Washoe County Fairgrounds for identification by a team headed by an FBI unit assisted by local medical and dental professionals. Washoe Med, St. Mary’s and numerous local social services performed family notifications and inventorying of the victims’ personal property in the days to come. In all, 40 governmental agencies participated in the tragedy, some in the minutes, others in the weeks, following the crash. A grim reminder remained for many years out on Highway 40 West just past the Mayberry intersection: a half-dozen carcasses of burned-out motor homes, relocated there from the site for salvage. This yarn was inspired by several references to Galaxy 203 in my book of old columns You’re doing WHAT to the Mapes?, causing two friends to remark that I’d never written a column about the tragedy itself. So here you have it. I give attribution to archival Reno Fire Department and RGJ accounts, resources in the Nevada Historical Society and the excellent 46-page post-incident report signed off by Sheriff Vince Swinney, a copy of the NTSB report, Coroner Vern McCarty and Truckee Meadows FPD Chief Gene Leblanc, that night’s incident commander.